So. It has been 9 months and 18 days since that first post. It's funny. When you think things are bad, you don't stop to think that your life can actually get worse. My life took such a bad turn that I couldn't even fathom thinking about happiness ever again. I felt cursed. But today is Easter and that means new beginnings, moving forward and fresh starts. 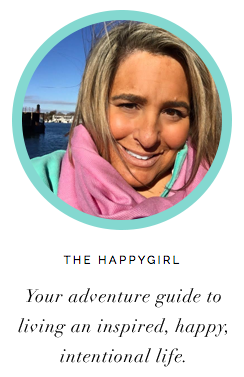 But before the experiment begins, let me give you some perspective into why I'm doing the Happy Girl Experiment. 1.) I am so lucky and blessed to be married to my best friend in the whole world. I'm still giddy when I see L.'s name pop up on my mobile. He is my sunshine. 2.) We have a great little dog, Emma, who bounces with joy every morning when she wakes up. Daily I am astounded by her excitement for life and her giddiness over a treat. That being said, in 2008 my life was on track. I levitated. I was THE HAPPY GIRL. Then it all fell apart. I was working in a job I loved at a Fortune 500 company I loved. I couldn't believe I got to do what I was doing for a living. I felt challenged every day and I felt like I was making a valuable contribution. I was also lucky enough to work alongside an extraordinary group of the smartest people on the planet. I was being compensated very well but I would have worked for free. I was just that HAPPY. I had good friends from around the world who I saw every weekend when we converged in Los Angeles for work. I was losing weight, working out, getting fit and healthy and eating right for once in my life. I was happily flying between 100,000 and 200,000 miles a year for my job. After two years of taxing fertility treatments and a relaxing few weeks off in December I was pregnant. We were overjoyed. We started decorating the nursery. In pink. I was laid off from a job I adored and a company I loved and had been with since 1995. It broke my heart on that Cinqo de Mayo morning to hear that my job was eliminated. My ego took a sucker punch. On the day I was laid off, we were signing the papers for our dream home. We didn't do it. I think of that house every day. I started wondering if I was cursed. I was depressed. As a girl who loved living her life on a plane, I was grounded. Traveling was done. L. was in a car accident. A teenaged driver wasn't paying attention. I no longer saw my contacts or friends in LA. I was sliding into a black hole of depression. I was once moving at the speed of sound juggling my crazy, busy, wonderful life and then it stopped flat into nothing. I ate to make myself feel better. But it didn't work. I gained weight and I was still numb. I didn't work out. I didn't move. The job search was disheartening. After more expensive fertility treatments/medications in December, we had 7 beautiful little embryos who thrived and then died. All seven babies died. The air left my body that day. An infection from one of the shots almost killed me on New Year's Day. Three days later, a reaction to the antibiotics I was taking for the infection caused me to break out into thousands of dangerous, angry, red hives covering my entire body. I was covered in a gooey, thick, medical paste from head to toe to ensure it didn't become the fatal disease where your skin falls off and YOU DIE. And, THAT is why I doing this experiment. I am The Girl Who Got Her Happy Back. For those of you who have lost your jobs, or your loves, or your babies or your homes or your joie de vivre this blog is dedicated to you. If you are depressed and you feel numb inside and every day is exactly like the last one and you wonder, what lies ahead? Why even bother, right? I get it. I feel that but you know what? I've had it. I have spent a year feeling sorry for myself and tender and pissed and sad and teary and wilted and angry and disgusted and I am done. I am going to explore every single thing that this incredibly juicy world has to offer to get my happy back. Thanks for joining me. I'm happy to have you along for the adventure.